This article describes proven consumer tips and products designed for lowering EMF radiation exposure from cell phones by AdrProVita. Common sense tips for lowering EMF radiation exposure! Modern electronic devices are an integral part of human life. These products release EMF pollution in a form undesired and harmful electromagnetic waves that create numerous potential health risks. This electrosmog pollution emitted especially from cell phones can affect the functionality of various body organs, the immune system, energy and vitality. Moreover, EMF radiation exposure may also cause a number of illnesses including high blood pressure, unexplained headaches, electo sensitivity disorder, diabetes, lower vitality and even cancer. That's why proven cell phone radiation protection products are becoming more and more important. According to World Health Organization reports cell phone radiation may deliver a very bad impact on the human brain. ADR-Protect by AdrProVita is a registered medical device in the European Union and is supported by clinical and lab research results and international awards (Golden Medal Eureka Inventions, Brussels and Golden Medal INPEX Therapeutics, Pittsburgh). 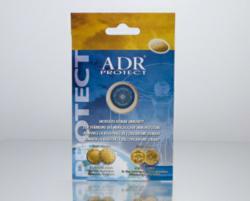 For more information about ADR-Protect visit http://www.adrprovita.com/products/EMF-protection-adr-protect-for-cell-phones. Imagine world without harmful influence of EMF's and high intensity geopathic radiation. Life without negative effects of electromagnetic radiation causing headaches, migraines, sleep disorders, chronic fatigue, exhaustion and hormonal disorders. These are just a few symptoms associated with the exposure to artificial (man made) electromagnetic radiation. The necessity for finding integrated solutions that take into account the health aspects has been recognized by the World Health Organization (WHO) and other international institutions. Following this path, AdrProVita provides a simple but unique solution, “protective shield” against the electromagnetic radiation. This shield utilizes the same process which the human body uses to absorb radiation in order to weaken its intensity. AdrProVita's EMF protection products provide the uniquely reliable solution that prevents the negative influences of EMF radiation.